Will Lawrence Gowan, now a fixture in Styx, perform his Wolfcop track on Monday night? 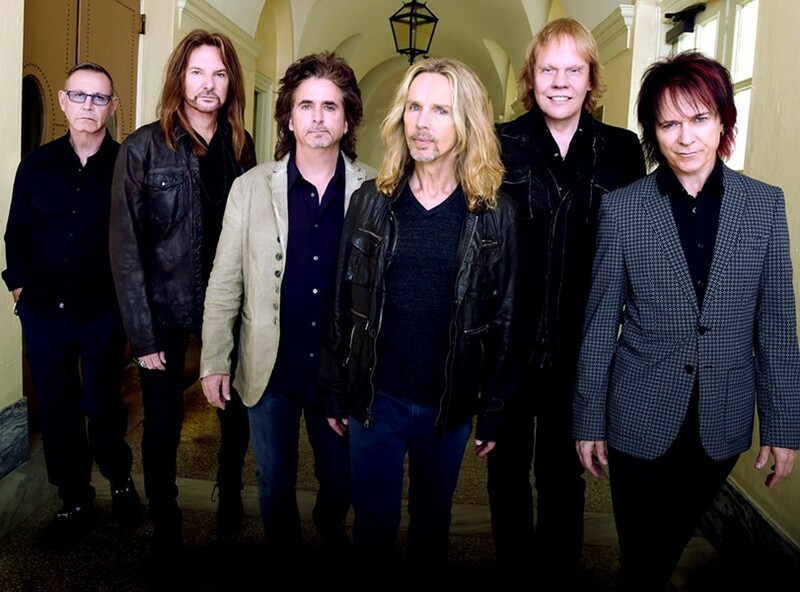 When you think of archetypal classic rockers Styx, which songs come to mind? Bitchin' rock anthems like "Too Much Time on My Hands" or "Renegade?" Power ballads like "Babe" and "Lady?" The geek-tastic "Mr. Roboto?" The latter—that's the one people wanna hear, and most of us take for granted that they'll play. They don't. That's a bummer. When Dennis DeYoung, the author and voice behind "Roboto" and "Babe," was replaced in 1999 by Canadian progressive-rock singer/songwriter Lawrence Gowan, Styx made decisions. Since "Babe" was written specifically about DeYoung's wife, it would've been weird for Gowan to sing it. Also, since DeYoung's penchant for more theatrical songs clashed with the band's desire to just rock, the remaining members cut "Roboto"—as much a Broadway-style musical number as a cool prog-rock concept album opus—from the set. Instead, Styx added Gowan's "A Criminal Mind," a mega-hit from his decade-and-a-half solo career in Canada. It's theatrical—a sort of "Bohemian Rhapsody" through a 1980s pop-AOR filter. But who cares? It's a cool tune with its own geek appeal—the video's concept is partly told in comic-book panels. And Gowan sings the hell out of the Styx stuff. I was watching a performance of "Come Sail Away" on YouTube and, just as Gowan called for this interview, the YouTube Gowan of the past was nailing the iconic line "... to caaaaarry on." You know, the second time, when the song opens up from solo piano-and-vocal to its full-band majesty. Every bit the stereotypically pleasant Canuck (except he's a born Scot), Gowan laughs heartily at the coincidence. And he's gracious when you praise his performance of Styx material. He says they made him welcome from the start. "The first day, before I even played a Styx song, Tommy [guitarist Shaw] said, 'Actually, could you play the last song you played at those shows we did together?'" That was "A Criminal Mind," and Gowan obliged. When he finished, Shaw said, "We should make that a Styx song." The song became a staple of Styx shows for years. And, after 15 years singing and playing keyboards in the band, Gowan's no longer the new guy. But another of his solo songs is getting a little boost thanks to the 2014 horror-comedy Wolfcop. A generous 2:20 portion of "Moonlight Desires," from Gowan's 1987 album Great Dirty World (Linus Entertainment), plays just as our hero, cursed cop Lou Garou, is getting the girl. The long, sensuous montage satirizes similar scenes from other 1980s films, and the song is a perfect fit: A high keyboard part intertwines with sultry lead guitar as Gowan—who, in the video, sports a (now long-gone) feathered mullet and stands atop a huge Aztec temple—sings (backed by Jon Anderson of Yes), "These moonlight desires/ haunt me/ they want me, they want me." It's almost as if the song were written for just that scene. Nope, says Gowan. He says the werewolf similarities aren't lost on him, and the song is about a duality, but not the man-wolf variety. "We all kind of live two lives; there's our internal life and there's the life that we present to the world." Late at night, he continues, "we live on more honest terms with ourselves—and some people blame that on the moon." So what are the chances of this song from Gowan's past solo life sneaking into Styx's set when the band plays Salt Lake City on Monday night? Once more expressing his gratitude for the warm reception he and his music got from his Styx mates, he says he'd welcome it—but "I wouldn't say it's likely." It is a Styx show, after all, and—even without DeYoung's songs, there's "just so much in the Styx canon of songs" that there just might not be room for it in the set. That's another bummer. Except, you know, Styx still has plenty of killer tunes. And Gowan did, however, offer this tidbit: "Earlier this year, Tommy and I were singing ['Moonlight Desires'] backstage."